Award-Winning Boone, NC HotelCrisp mountain air and boundless mountain vistas welcome you to the Holiday Inn Express Boone hotel. 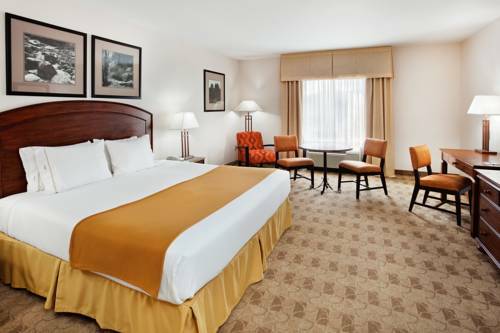 Thanks to our close proximity to businesses and attractions in Boone, NC, our hotel is the ideal choice for any traveler.Vacationers in Boone, NC love that our hotel's near popular spots like the Blue Ridge Parkway. We're also close to the nature preserves of Grandfather Mountain and just minutes from Tweetsie Railroad, a family-favorite Wild West adventure and four area ski resorts. Thrill-seekers can venture to Scream Time Ziplines for the ride of their life while others enjoy browsing the Mast General Store, where classic mercantile goods and outdoor gear line the shelves.Since we're near organizations like Appalachian State University, Samaritan's Purse and Watauga Medical Center, business travelers appreciate our hotel's location in Boone, NC. In addition, we feature a 1,650-sq-ft meeting room that is perfect for meetings. Utilize our state-of-the-art business center to plan your event.Whether business or pleasure brings you to Boone, NC, our hotel's free high-speed, Wi-Fi access connects you to colleagues and friends. Begin the morning with a tasty cinnamon roll from our free Express Start breakfast bar. Later, you can enjoy a refreshing dip in the outdoor pool. If you're looking for top-notch hotels in Boone, NC, you've found it! Peddler Steak House: Classic steak house with salad bar. Business casual dress and atmosphere. Boone MallJC Penny, Old Navy, Belk, TJ Maxx, Sears Homestore, Panera Bread, Claires, Bath and Body Works, Radio Shack, The Shoe Dept., Hallmark, GNC, Gamestop, BlackBear Books, Regis Hair Salon, Rue 21, Maurices, AT&T, Dollar General. Tanger OutletsChico's, Coach, Levi's, Aeropostale, Banana Republic, J. Crew, Polo Ralph Lauren, Oshkosh B'gosh, Rack Room Shoes, Skechers, Gap, Kilwin's Chocolate & Ice Cream, etc. Grandfather MountainA true landmark to the outdoor spirit.